Over the holidays I took the chance to catch up on some reading. 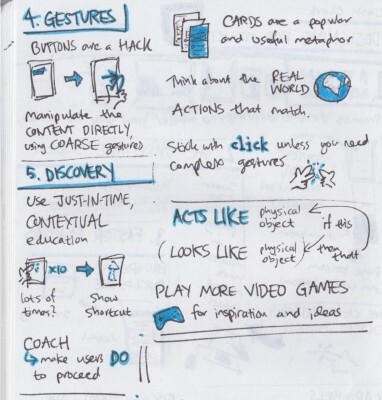 One of the books I read was Josh Clark’s Designing For Touch from A Book Apart. 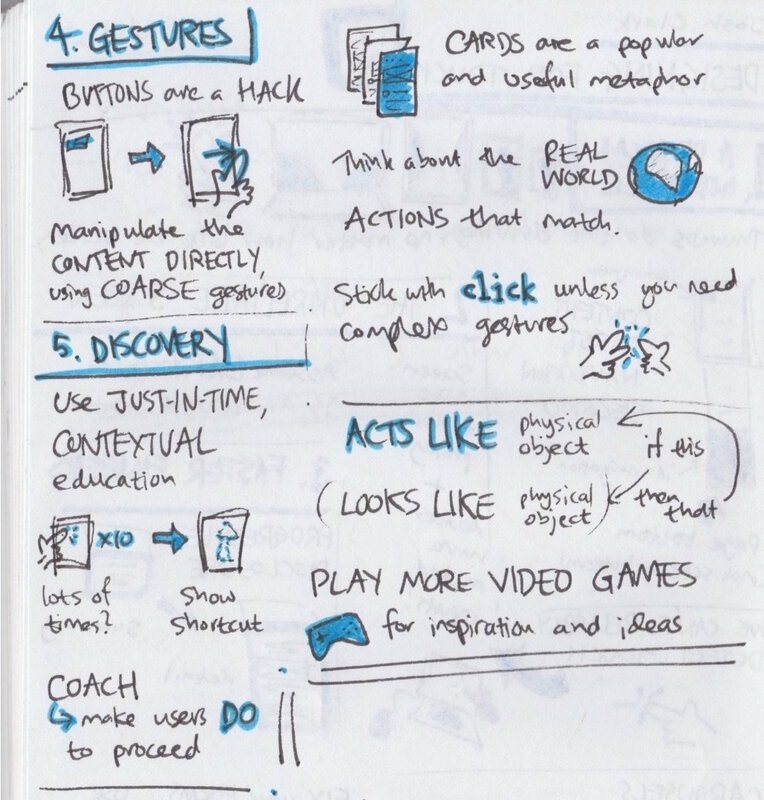 Here are some quick thought and sketchnotes. Clark talks about how thumbs do the driving, no matter how large the screen. 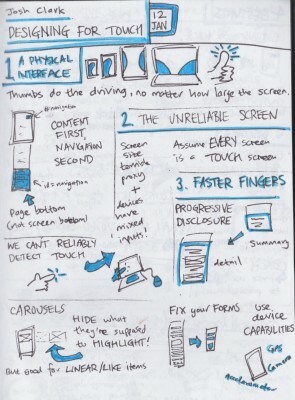 This has big implications for how we design our interfaces. Tap targets need to be big and the user’s control will be imprecise. That leads on to thinking about letting the user manipulate the content directly, using coarse gestures: big sweeping movements that fling things around. Clark also talks about matching actions with the real world: if something on the screen looks like something in the real world, it must act like it. Another focus of Clark’s book is progressive disclosure and just-in-time, contextual, information. Have all the information ready for the user, but show teaser trailers at first, and let them dive deeper when they want to. Clark recommends playing more video games for inspiration and ideas (I am inclined to agree :) ), especially for the learning / tutorial parts of them. Video games often make users do the required action to proceed, which leads to more effective learning. 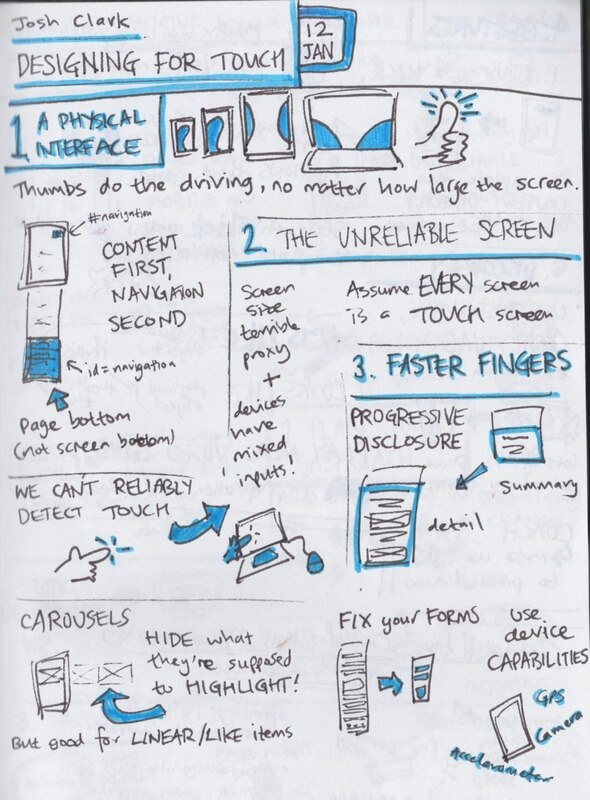 In summary: Designing For Touch is well-sized, well written, and contains lots of useful tips and examples for helping get your head around making sure that your interface is touch-friendly.